Mamba chews have been popular with children and adults alike for over 60 years. These delicious fruit chews are available in a range of delicious varieties and are great for sharing. What's your favourite flavour? 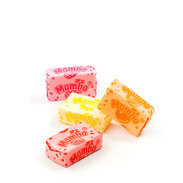 Mamba stands for fruit-flavoured chewing fun in tasty varieties: Strawberry, Raspberry, Orange, Lemon or Cherry. The fruit treat that is perfect for sharing and passing around! Each bar contains four individually wrapped packs of six chews. Mamba continues to be an affordable treat and is enjoyed by kids of all ages. Great for carrying on the go as well as for sharing with friends and family. Mamba successfully launches in the US in 1986, followed in the 1990s by other major markets such as Poland and Russia where Mamba becomes one of the most popular chewy candy brands. This small fruit chew became an immediate hit due to its delicious fruity taste and affordable price.